Home / Celebrities / Sportswomen / The ‘400M Diva’ Natasha Hastings Talks Fitness, Body Confidence & Self Love! Natasha Hastings is an Olympic, World and US National Champion Track and Field Sprinter. She specializes in the 400 and 4×400 meter relay events. Born and raised in New York City, Natasha started running at the age of 9. Continuing her successful career, Natasha finished second in the 400 meters at the 2015 USATF National Championship and won a Silver medal with the 4×400 meters relay team at the 2015 World Championships. Making a return to the Olympics, Natasha finished third in the 400 meters at the 2016 US Olympic Trials. After finishing fourth in the 400 meters final, Natasha won her second Olympic Gold medal, running the fastest split, as a member of the 4×400 meter relay team. Famously known as the 400M Diva, to give you a glimpse of her personality and professional life, Natasha Hastings vlogs on her YouTube channel too. 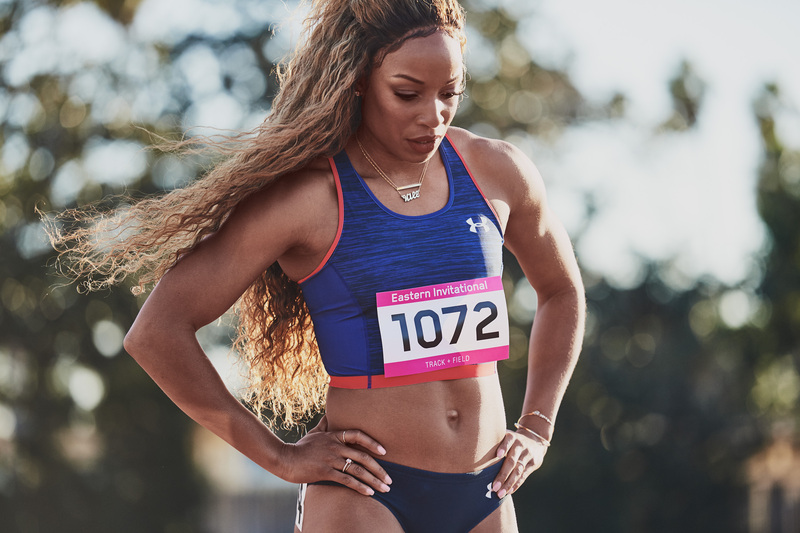 To tell you so much more about the 400M Diva, Women Fitness recently caught up with the spectacular Olympian and spoke to her about her life, dreams and her signature red lipstick. You began your track career at a very young age and made a first place win at the USATF Junior Olympics in the 400 metres in the Youth Girls division. Since then there has been no turning back. If you had to define your career, in your own words, how would you define? My career has been one that I would certainly describe as a journey with many ups and downs. I’ve had to find and redefine myself several times throughout. Ultimately though, I believe every moment has been pivotal in the overall outcome and the success I’ve experienced over the years. With every defeat, I’ve had to find some sort of strength within to overcome and rise above the challenges set before me. But I truly believe that my victories have been much sweeter because of my failures. I’ve learned to embrace every moment of the journey. What does the workout routine of the ‘400M Diva’ look like? I train 5 days per week. 3 of those days are in the gym in the mornings followed by an afternoon session on the track. Each day is tailored depending on the phase of training that we are in, and the focus changes throughout the year. During the months of November through February, our training cycles tend to be high volume and strength based. From March through August, we decrease the volume and focus on increasing speed. My training days can sometimes be as long as from 9 am to 2 pm, while shorter days are just a couple hours.